The hot dog. Such a simple food. A tubular oasis of ground up "you don't want to know" wedged within baked leavened dough. Hey, I'm not knocking it. In fact, I'm standing up for the humble, often ridiculed wiener in a bun. Think of it. It's easy to make. It can be BBQ'd, grilled, pan-fried, boiled, baked, nuked or even eaten as is. It's portable. Kids love it, adults love it, seniors love it. It transcends socio-economic and cultural boundaries. Ah yes, the simple hot dog has gone global. 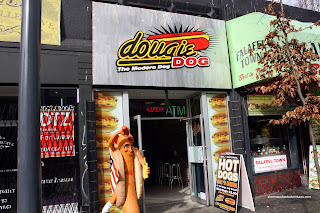 First it was Japadog, then Tikka Dog, now there's Dougiedog. Dougiedog??? Wait, that doesn't sound very exotic. In fact, it sounds as exotic as a HK-style breakfast (complete with it's own wiener in place of a sausage). Well, when Mel (Gourmet Fury) alerted us of this new hot dog joint out on Granville (just around the corner from The Dogfather), I had to try it. Well, as per usual, Kim made it out there first and laid the groundwork. He had tried the Seoul Dog and the Tokyo Dog. Hey, I decided to try the exact same ones. Fresh from splitting a Banh Mi from Viet Sub, we were going for meat in a bun overload. It was like the time when I had La Taqueria, Fin ch's and 2001 Flavours all in one shot. Doug himself prepared the tubular delights for us. The claim to fame here is that their wieners are made with no preservatives and with fresh meat. They are never sitting around in a factory too long. Furthermore, these wieners exhibit the "snap" usually reserved for those you find in Chicago or New York. Unfortunately, we don't get much of that here. The only one that I've tried that is remotely close is Japadog's Kurobuta pork wieners. But I find those more chewy than snappy. Think of the ones here akin to European wieners. Viv and I both agreed that the Seoul Dog was better than the Tokyo Dog. Nothing against the latter; but when compared to Japadog's Terimayo, this one was missing something. Maybe the grilled onions? With the addition of Bonito flakes combined with the shredded Nori, it's definitely fish tasting (I personally liked it). In the Seoul Dog, you get flavours normally not seen in a hot dog. 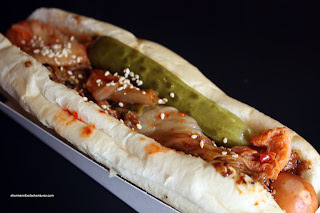 You have spicy Kimchi, Bulgogi (BBQ Korean beef), pickle and sesame. Nestled in a soft steamed bun, the flavours in this dog really worked. You could really get the Korean flavours even with the weird addition of a dill pickle. For the price they charge ($6.95 for the specialty hot dogs), you get a pretty big hot dog (it's actually 2 small wieners). 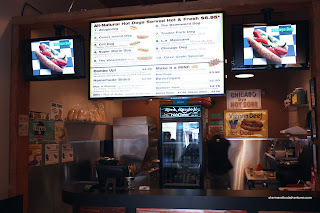 Their regular dogs are much more moderately priced at $4.50ish. But I must note that the Terimayo at Japadog (what the Tokyo Dog aspires to be) is only $4.50. You pretty much summed it. It is an interesting option but, at that price... I am still curious about the other offerings, though. BTW, did you have their root beers? No root beer... too much sugar! Taste being personal applies to hotdogs as well. 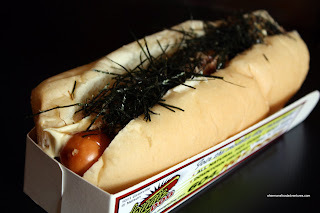 I much prefer the classic American hotdogs than Japadog's fishy nori, messy terimayo and garlicky kimchi. At home we add fresh or lightly picked cucumber, carrots and turnip (stir-fried until most water is drained off). Costco sells Taiwanese pork floss @$10 a big tub 454g. It adds nice flavor to buns, bread and rice. Did you notice the long lineups @TNT cooked food section and other Asian food courts that sell pork floss and/or hotdogs rolled in bread and/or sticky rice. These rolls are then cut into 'sushi' bite size. That's true, I do like the standard hot dog as well. When I was in San Fran and NYC, they're more into the classic hot dog. Up here, it's all about the Asian influences. I've heard that the Indian dog is so-so with something lost in translation. I still need to try that out. Aree's Dog House on Broadway serves up the more classic hot dog, but as it is in Vancouver, they are never as good as in the US. As for the Taipei hot dogs, I haven't tried one yet and probably it'll be a good idea. Thanks for the tip! In terms of the pork floss, I buy it all the time, and incidentally at Costco and TNT. I am a big fan of "chee fan" which is the handrolled rice roll with salty donut, pork floss and pickled mustard greens as you speak of. However, unless it were strictly for takeout purposes, the best places to get chee fan is Spicy Court or Shanghai River. I find the ones at TNT to be a bit dry and the salty donut to be not crispy. I checked your review on Spicy Court and planned to go there until I found out @urbanspoon that they now have new servers with attitude. Hehe .. I shall go to Shanghai River then. Actually, the servers at Spicy Court have always been indifferent... LOL... Yah, best to stay away if you want good service. is Dougie Dog worth the try? It seems like another one of those joint. Btw, I thought "Taiwanese hotdogs" are just sausages on skewers. But I have to say they are pretty darn good. I think Dougiedog is worth a try at least once. It's different enough to warrant it. Not sure if it will be that impressive if you take into account you're paying $7 for a hot dog. Yah, I think it might've been a stretch to group Taiwanese sausages and Chee Fan into the same category as hot dogs. Both are not hot dogs in the North American sense, but I guess they're portable food. EatnbeMerry, it's never a bad thing to suggest tasty ideas!